So you’re upset that Facebook collected data on you? The sweetest revenge isn’t deleting your account. It’s learning how to profit from the whole sorry mess. At its heart, the Facebook scandal is really about cybersecurity. And it brings into sharp focus a point I’ve been making on these pages for months — invest in cybersecurity stocks, and make a bundle. See, the growth of cybersecurity doesn’t just come from defending against a hoodie-wearing hacker pilfering data through an unguarded back door to a company’s network. As I noted to Banyan Hill readers last August with my article “The Next Boost to Cybersecurity Stocks Is Here,” it’s also about government regulation. For instance, on May 25, the European Union’s “GPDR” law — short for General Data Protection Regulation — goes into effect. The EU’s new rules require, among other things, that companies encrypt all “nonpublic information” regardless of whether it’s held or transmitted by a corporate entity like a bank or software firm. It promises to do for data privacy what other landmark pieces of legislation, like the Pure Food and Drug Act of 1906, did for other industries — force companies to put the safety and security of their customers on an equal footing with the pursuit of profits. It may sound odd to talk about regulation as an engine for investment growth. On the other hand, think about the Pure Food and Drug Act. It forced out fly-by-night sellers of tainted food and snake-oil “patent medicines.” Instead, companies invested across a diverse range of opportunities — research labs to develop effective medicines, cold-storage warehouses (to minimize food spoilage) and better packaging that kept out weevils and food pests. I see the same thing happening with the cybersecurity industry as regulators on both sides of the Atlantic investigate the Facebook debacle. Likewise, I think it will also force a “late to the game” reconsideration by many tech companies that are in the business of harvesting data from their customers. Facebook itself provides a good example. 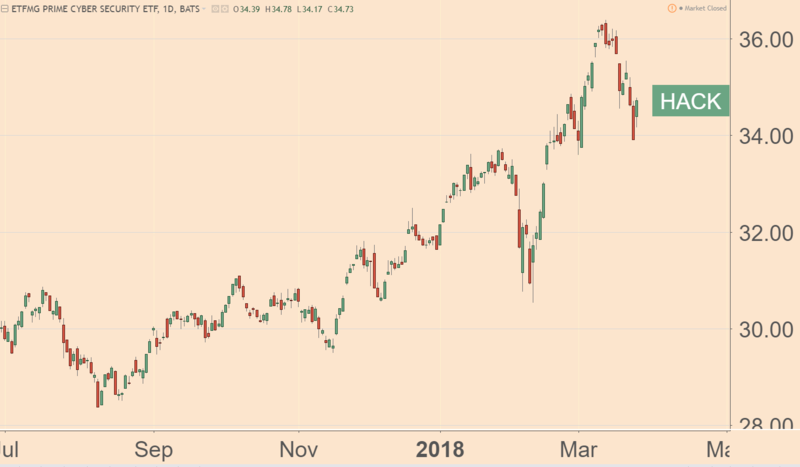 When I first started writing about cybersecurity last August, I recommended the ETFMG Prime Cyber Security ETF (NYSE: HACK). Back then it was priced at $29. It since shot as high as $36 — a gain of nearly 25% in eight months — before last week’s trade worries forced a small pullback in the sector. I think this exchange-traded fund, and cybersecurity stocks in general, are primed to move even higher between now and the end of the year. I have a number of stocks in the Total Wealth Insider model portfolio designed to benefit from this and other cybersecurity trends. It’s a key reason why industry-wide spending is rising at an accelerated pace, to a cumulative $1 trillion between now and 2021. Next »I’m Fed Up With America’s One-Party Government. Are You?